This triptych shows a coronal mass ejection or CME as it burst off of the sun in the morning of Jan. 13, 2013. The images were captured by NASA's Solar Terrestrial Relations Observatory (STEREO). A huge sun eruption on Sunday (Jan. 13) unleashed a wave of solar plasma aimed at Earth that may amplify the planet's northern lights displays later this week, NASA scientists say. 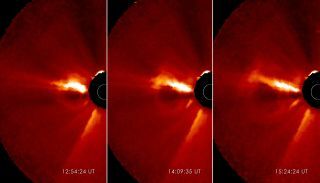 The solar eruption, called a coronal mass ejection (CME), occurred at 2:24 a.m. EST (0724 GMT) on Sunday and should take about three days to reach Earth, researchers said. The space weather event is not strong enough to interfere with satellites or electrical systems on Earth, they added. Observations from NASA's twin Solar Terrestrial Relations Observatory spacecraft the Solar and Heliospheric Observatory showed that the CME shot away from sun at speeds of 275 miles per second — about 990,000 mph (1.6 million kilometers per hour). Solar storms of this speed are fairly typical and have not caused substantial geomagnetic storms in the past, NASA officials said in a statement. Geomagnetic storms occur when the charged solar particles interact with the Earth's Earth's magnetic field, which can cause problems for satellites, communications, and power grids. But solar storms similar to Sunday's eruption can produce supercharged northern and southern lights at the Earth's poles, NASA officials said. This image from NASA's Solar Dynamics Observatory was captured on Jan. 13, 2013, at 8:13 p.m. EST. At the center sits a large cluster of sunspots, dubbed Active Region 11654. The sun is in an active phase of its current 11-year weather cycle, which scientists call Solar Cycle 24. The sun's activity cycle is expected to reach its peak this year. Two particularly active sunspot regions, called AR 11652 and AR 11654, have produced four low-level M-class flares since Jan. 11, space weather officials said. The most powerful solar flares, X-class flares, have the most significant effect on Earth. They can cause long-lasting radiation storms in our planet's upper atmosphere and trigger radio blackouts.